Do you want to learn more about sauna? Do you already love sauna? Do you think Australia needs more sauna? Are you keen to see more community building in Australia? Are you passionate about public health? Are you passionate about relaxation? Do you think people should spend more time together? If you answered “Yes” to any of these questions, then you should join the Australian Sweat Bathing Association. Incorporated in 2016, ASBA has officially started to seek members. As described below, to become a proper organisation we need financial support. Currently we are “all passion no assets”. It’s going to be a long, slow road – we need all the help we can get, financially and otherwise. That’s why ASBA is putting out a call for FOUNDATION MEMBERSHIP. If you join ASBA before April 3, 2019, you will forever be acknowledged as a founding member who helped to make the organisation possible. In addition to ASBA’s awesome Welcome Pack, all Foundation Members will receive a special piece of commemorative merchandise once the foundation period closes. You’ll also get an (F) in your membership code, marking you for eternity. See below for how much it costs – we ask that you pay what you can afford. Be part of history. All you have to do is read the information below and fill out the membership form. We’ve used Google Forms to create the sign-up sheet, because it’s easy to design and completely free. The form will take 10-20 minutes to complete. For pricing information, see below. No payment is required when completing the membership form. Once we have approved your membership, you will receive a welcome letter with payment instructions. 2.3 Is there a choice of ASBA t-shirt? 2.4 What about the ASBA towel? 3 Where does my money go? ASBA is a collaborative organisation that thrives on member participation. In addition to promoting wellbeing, we are also committed to community building all over the country. We want to bring people together. #saunamakespeoplehappy. If you think community building is important, you should join ASBA. We are determined to create a better society. We want to #spreadthegoodheat. We need Foundation Members who believe in the vision and are willing to support us by joining. Sauna is a gateway to social connection. Sauna makes you feel good. We want Australia to learn this. See our goals for more information. Be part of the journey. Become a Foundation Member! If nothing else, you will get an awesome Welcome Pack. Who doesn’t want an ASBA tote bag, waterproof Certificate of Membership, and some sauna-proof business cards? See no. 10 below for the extra Foundation Member bonus! ASBA members will receive a regular flow of information about sauna and related topics. We’ll send regular email updates, including our quarterly newsletter Full Steam Ahead. We’ll also be trying to post loads of online content online, and we’ll be doing as much media and public outreach as possible. And of course, if you want to learn how to sauna, then ASBA is the place for you. We’ll do whatever we can to create sauna opportunities in a location near you, and we’ll provide a range of educational material. You can also connect with other ASBA members and link up to visit local saunas. As an ASBA member, you can always ask us a question. Soon we will develop a proper national network and information database, but in the meantime we will field any questions you have and direct you to someone who might know the answer. Want to build a sauna? Want to learn where your nearest sauna is? Want to connect with fellow sauna enthusiasts? Join ASBA. 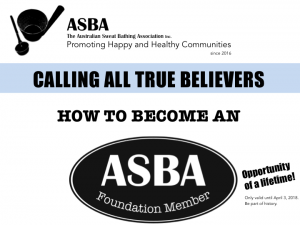 As an ASBA Foundation Member, you are supporting the growth of a new Australian sauna culture. ASBA hopes to create nation-wide network of local and regional associations that are dedicated to promoting community building and public health. Be part of the adventure! ASBA plans to host a range of public sauna events around Australia. Foundation Members will be the first to know about these events – you can also suggest events, or even host your own! ASBA is committed to member involvement. To allow formal channels of input, ASBA has decided to host two (2) brainstorming carnivals per year, where members gather for an outdoor sauna party and discuss plans about the future of the association. This is way more fun than a normal meeting. Foundation Members are also entitled to attend the ASBA Annual General Meeting (AGM), which takes place in late June every year (in the new festival season known as Shvitzmas). See our constitution (Sections 26-27) for more information about the AGM. The next AGM will be held June 24, 2017, at ASBA headquarters in Belfield, Sydney. Join before then, and you will be welcome to attend. Sauna is increasingly being recognised as a healthy activity. Some cultures have known this for a long time, but medical research is finally starting to appear. Visit out sauna research page for more information. And if you already know how good sauna is, then you finally have a chance to connect with fellow enthusiasts! Isn’t it about time there was a proper sauna culture in Australia? You can help us build it. By joining ASBA, you are bound to meet a range of interesting people, especially if you become involved in the organisation by volunteering or joining a local chapter. If you want to meet new people, please come to an ASBA event. Or contact us and we’ll help you find people to connect with in your local area. ASBA is Australia’s official representative in the International Sauna Association (est. 1956). This means that you are not just joining a national organisation – you are joining a global movement. Amongst other things, the ISA holds an international congress every four years. The next one is in Sweden, June 2018. If you become an ASBA member before then, you will be welcome to join the ASBA delegation. Several other exciting events are planned for the congress. Stay tuned – by joining up. If you want to volunteer, ASBA will have plenty of opportunities. Check our goals to see how many things we are hoping to achieve. If you are willing to help, in any manner at all, then you have the opportunity. We’ll ask you about this on the sign-up form. Sounds good – Sign me up! 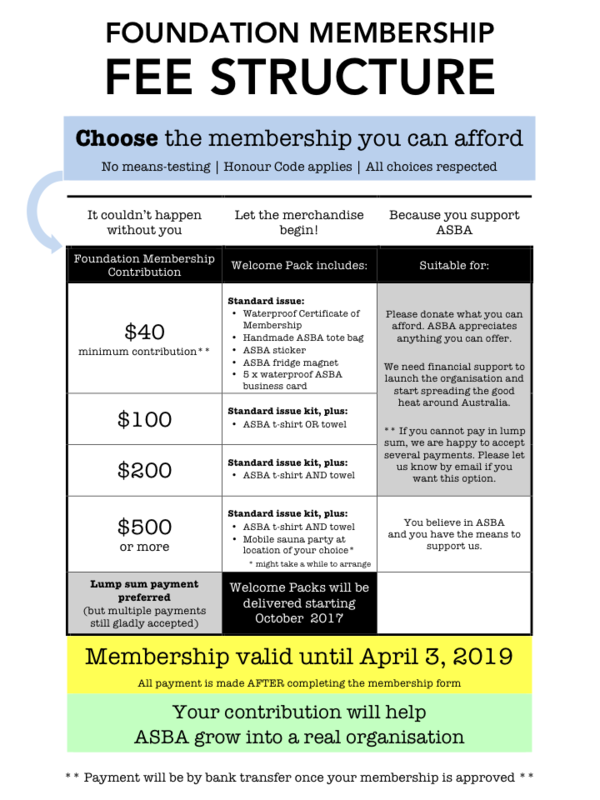 At ASBA, we think you should pay what you can afford to join. We have set the minimum joining fee at $40, because with enough people, even this small amount will be enough to run the organisation. And if even that’s too much, you can pay in installments. But if you can afford to pay more, we’d love you to. As explained below, the more money we have, the more we can grow ASBA. You’ll get some extra merchanidise too. No payment is required when completing the membership form. Once completed, ASBA will review your application and send a written confirmation within fourteen (14) days. The confirmation will include bank transfer details. Your membership will be fully confirmed once you have paid your nominated membership fee. This approach means that no money is lost to third-party merchants. It also means we get to write you a letter of welcome. Your Welcome Pack will be mailed after payment has been received. Welcome packs will start being delivered in July 2017. Is there a choice of ASBA t-shirt? Yes. To start, we will have two choices. Designs will be available shortly and posted here on the website. If you join before then, we’ll email you directly to see what shirt you want. There will be a loud shirt and a more polite, subdued shirt. And yes, the shirts will also be for sale if you want one but aren’t getting one in your Welcome Pack. Stay tuned for more. What about the ASBA towel? This is also currently under design. It will be a small sitting towel – not for drying, but for using in the sauna. We’ll soon branch out to larger towels, as well as robes and other sweat bathing regalia, but for now we’ll start with a small sitting towel. All fees raised during ASBA’s Foundation Membership period go toward supporting our running costs so that ASBA can grow into a proper, functioning organisation. ASBA is 100% not-for-profit, which means all funds are used to support our community building agenda. Currently ASBA is run on a completely volunteer basis. We will provide a fully transparent budget as soon as practicable, i.e. once we have a full list of annual costs. Currently we are running on the smell of an oily rag that’s being burned by both ends of the candle. We are also still finalising our insurance options at the time of writing (April 2017).We’ll also have to account for the International Journal of Sauna Studies, which ASBA is underwriting. Depending on several factors (e.g. insurance costs, and external funding for the IJSS), ASBA total basic running costs are projected to be somewhere from $1000–$2000 per year in the initial phase. Any surplus will be spent on growing the empire. ASBA is a community-focused, not-for-profit organisation. Everything we do is about brining people together and creating positive vibes. We believe that sauna and related types of bathing are powerful technologies for both physical regeneration and social change. As an ASBA member, you subscribe to this vision. You don’t need to do anything beyond paying the membership fee, but we also hope ASBA members will promote the vision wherever you have time and inclination. 6.2.7 a right, privilege or obligation which a person has by reason of being a member of ASBA is not capable of being transferred or transmitted to another person, and terminates on cessation of the person’s membership. 6.3.4 above and beyond sub-clause 6.3.1, members have a responsibility to spread the good heat (i.e. to engage in thermovangelism) wherever a member’s internal sense of morality and civic duty compels them to do so, and in whatever way the member sees fit, so long as such activity does not undermine ASBA’s goals stated under clause 3, the definitive interpretation of which rests with the ASBA executive in the case of any dispute or disagreement. ASBA will shortly start accepting supporting members, which is another name for group members. This option will open later in 2017, after individual membership is underway. We are still establishing our systems. If you are interested, please see section 7 of the ASBA Constitution until more information becomes available. If it is likely that your organisation will want to become a supporting member, at least one person from that organisation must be an individual ASBA member. Why not you? For any questions about supporting membership, Contact Us. ASBA is using Google Forms for our sign-up sheet. This is a powerful and free platform that allows us to collect the information we need with minimum fuss. If we had more money then we’d build a fancy form right here on the website, but we don’t have any money. So Google it is. See below for more information about the sign-up form. When you are ready, just follow the link. You won’t regret it. The sign-up form will take 5-10 minutes to complete, possibly longer if you want to write long answers. See below for why we collect information. 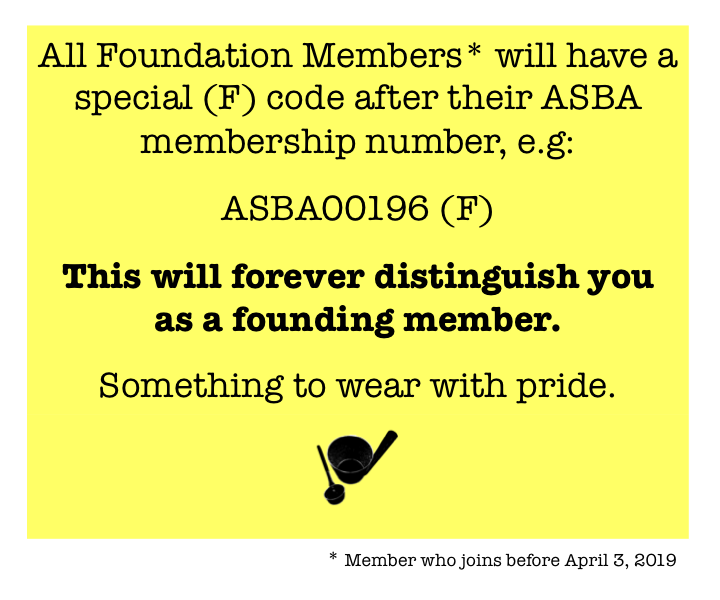 Becoming an ASBA Foundation Member is a big deal. This isn’t just any old organisation. We are committed to engaging our members and building a collaborative, nation-wide association that brings positive change to local communities. The more we know about our members, the more effective we can be. The sign-up form therefore asks questions about your personal details, and reasons for joining ASBA. It also asks if you are interested in starting a local sauna association, or at least if you would be interested in joining one. if you’re interested in volunteering for ASBA in any capacity (use your imagination! ), you can nominate this on the sign-up sheet. ASBA is a not-for-profit organisation. Established 2016. We aim to create a new Australian sauna culture. ASBA promotes physical health, mental health, and community building. 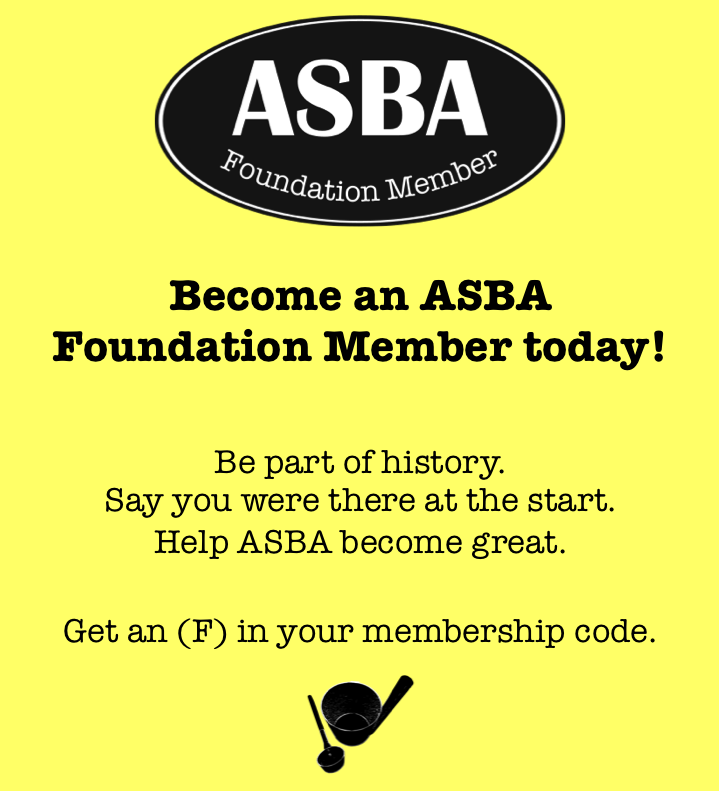 Become an ASBA Foundation Member today! ASBA is a not-for-profit organisation. Established in 2016, we aim to create a new Australian sauna culture. ASBA promotes physical health, mental health, and community building. ASBA is a member of the International Sauna Association (est. 1956).